Department of Science and Humanities, Krishnasamy College of Engineering and Technology, Cuddalore, Tamil Nadu-608 002, India. In this paper a new class of sets called regular generalized $\delta$-closed set (briefly rg$\delta$-closed set)is introduced and its properties are studied. Several examples are provided to illustrate the behaviour of these new class of sets. A.A. Omari and M.S.M. Noorani, On Generalized $b$-closed sets, Bull. Malays. Math. Sci. Soc., 32 (2009), pp. 19-30. S.P. Arya and T. Nour, Characterizations of $s$-normal spaces, Indian J. Pure and Applied Maths., 21 (1990), pp. 717-719. P. Bhattacharya and B.K. Lahiri, Semi-generalized closed sets on topology, Indian J. Maths., 29 (1987), pp. 375-382. Y. Gnanambal, On Generalized Pre-regular closed sets in topological spaces, Indian J. Pure Appl. Math., 28 (1997), pp. 351-360. D. Iyappan and N. Nagaveni, On Semi generalized $b$-closed set, Nat. Sem. On Mat. Comp. Sci., Jan., (2010), Proc.6. N. Levine, Generalized closed sets in topology, Rend Circ., Mat. Palermo., 19 (1970), pp. 89-96. N. Levine, Semi-open sets and Semi-continuity in topological spaces, Amer. Math. Monthly., 70 (1963), pp. 36-41. H. Maki, R. Devi, and K. Balachandran, Associated topologies of generalized $alpha$-closed sets and $alpha$-generalized closed sets, Mem. Fac. Sci. Kochi. Univ. Ser. A. Math., 15 (1994), pp. 51-63. H. Maki, R.J. Umehara, and T. Noiri, Every topological space is Pre-$T$, Mem. Fac. Sci. Kochi. Univ. Ser. A. Math., 17 (1996), pp. 33-42. A.S. Mashhour Abd El-Monsef. M. E. and Ei-Deeb S.N, On Pre-continuous and weak Pre-continuous mappings, Proc. Math. Phys. Soc. Egypt., 53 (1982), pp. 47-53. O. Njastad, On Some classes of nearly open sets, Pacific J. Math., 15 (1965), pp. 961-970. N. Nagaveni, Studies on generalized homeomorphisms in topological spaces, Ph. D., Thesis, Bharathiar University, Coimbatore 1999. 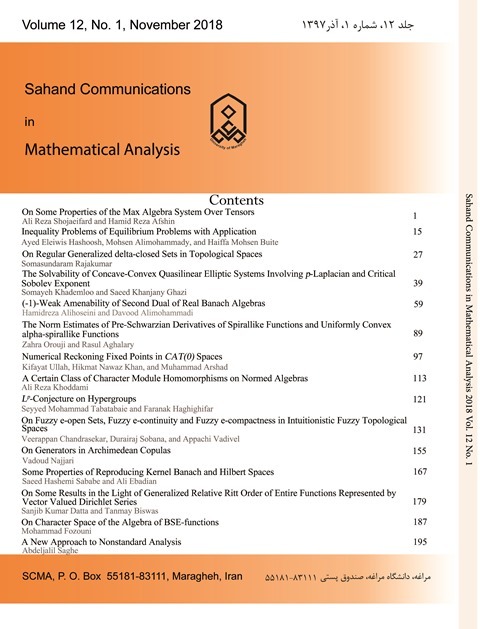 L. Vinayagamoorthi and N. Nagaveni, On Generalized-$alpha b$ closed sets, Proceedings, ICMD-Pushpa Publications, Vol. 1., 2010-11. M.K.R.S. Veerakumar, Between closed sets and $g$-closed sets, Mem. Fac. Sci.Kochi Univ., Math., 21 (2000), pp. 1-19. N.V. Velico, H-closed topological spaces, Amer. Math. Soc. Transl., 78 (1968), pp. 103-118. N. Palaniappan and K. C. Rao, Regular generalized closed sets, Kyungpook Math. J., 33 (1993), pp. 211-219.